The Supreme Court “patent case of the week” for this week is Carver v. Hyde, 41 U.S. 513 (1842). Readers of this case will find it interesting for several reasons. First, the language used by the Court sounds very similar to modern day Doctrine of Equivalents cases. Second, from a functional claiming perspective, it includes a statement that one cannot patent a desired result: “Now the end to be accomplished is not the subject of a patent. The invention consists in the new and useful means of obtaining it.” Carver v. Hyde, 41 U.S. 513, 519 (1842). Third, the patent was written in a problem-solution format. And, fourth, to some degree the Court looked to the advantages and object of the invention stated in the specification. The Court also looked to the “summing” section of the patent; but, that summing section is the modern day equivalent of the”claims” section. The use and purpose sought to be accomplished by the Hall patent was the radial expansion of the dress form, but it is well settled by the authorities that the end or purpose sought to be accomplished by the device is not the subject of a patent. The invention covered thereby must consist of new and useful means of obtaining that end. In other words, the subject of a patent is the device or mechanical means by which the desired 228*228 result is to be secured. Carver v. Hyde, 16 Pet. 513, 519; LeRoy v. Tatham, 14 How. 156; Corning v. Burden, 15 How. 252; Barr v. Duryee, 1 Wall. 531; Fuller v. Yentzer, 94 U.S. 288. Knapp v. Morss, 150 U.S. 221, 227-28 (1893). It is interesting to contrast that statement from Knapp v. Morss with modern day subject matter eligibility analyses, where courts characterize detailed claim language as being “directed to” abstract ideas. For example, one could imagine that a modern day subject matter eligibility analysis would begin by characterizing the Knapp v. Morss claim as being directed to “radial expansion of a dress form”– exactly what the Knapp v. Morss court instructed was not the invention in that case. JOSEPH A. HYDE AND OTHERS, DEFENDANTS IN ERROR. The case was submitted to the Court, on printed arguments, by Dexter, for the plaintiff in error; and by Messrs. Fletcher and Phillips, for the defendants. 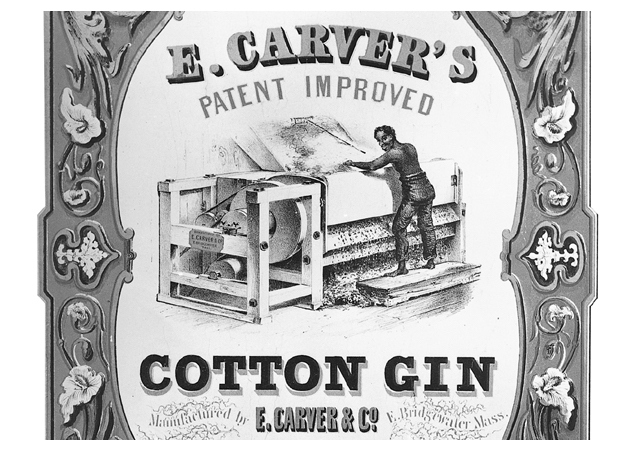 “Be it known, that I, Eleazer Carver, of Bridgewater, in the county of Plymouth, and state of Massachusetts, have invented a certain improvement in the manner of forming the ribs of sawgins, for the ginning of cotton; and I do hereby declare that the following is a full and exact description thereof. “In the cotton-gin, as heretofore known and used, the fibres of the cotton are drawn by the teeth of circular saws, through 514*514 a grating formed of a number of parallel bars, or ribs, having spaces between them sufficient to allow the saws to pass, carrying the fibres of the cotton with them, (which are then brushed off by a revolving brush,) but not wide enough to let the seeds, and other foreign substances, pass through. Above the saws the ribs come in close contract, thus forming a shoulder at the top of the space between them. Various forms have been given to the bars or ribs, with a view to procure a free passage of the cotton; but the cotton-gin, as heretofore made, has been always subject to the inconvenience of the grate becoming choked by hard masses of cotton and motes, or false seeds, collecting in the upper part of the spaces between the ribs, and impeding the action of the saws, and also preventing the mass of cotton which is drawn by the saws up to the top of the spaces, but not drawn through them, from rolling back freely, so as to pass again over the saws, as it should do. The specification then proceeds to describe the invention more particularly, by referring to and explaining the drawings annexed to it, showing the advantages of his improvement, the manner of arranging the ribs in the gin, and the mode of inserting and fastening them in the framework. This description could not be comprehended without an exact drawing; nor is it necessary, in order to understand the questions of law in dispute between the parties. It is therefore omitted. After giving this description, the specification states the improvement, of which the patentee claims to be the inventor, as follows. Supreme Court Case of the Week: Prouty and Mears v. Ruggles et al. The patent is for a combination, and the improvement consists in arranging different portions of the plough, and combining them together in the manner stated in the specification for the purpose of producing a certain effect. None of the parts referred to are new, and none are claimed as new; nor is any portion of the combination less than the whole claimed as new, or stated to produce any given result. The end in view is proposed to be accomplished by the union of all, arranged and combined together in the manner described. And this combination, composed of all the parts mentioned in the specification, and arranged with reference to each other, and to other parts of the plough in the manner therein described, is stated to be the improvement, and is the thing patented. The use of any two of these parts only, or of two combined with a third, which is substantially different, in form or in the manner of its arrangement and connection with the others; is therefore not the thing patented. It is not the same combination if it substantially differs from it in any of its parts. The jogging of the standard into the beam, and its extension backward from the bolt, are both treated by the plaintiffs as essential parts of their combination for the purpose of brace and draft. Consequently the use of either alone, by the defendants, would not be the same improvement, nor infringe the patent of the plaintiffs. Prouty and Mears v. RUGGLES ET AL., 41 U.S. 336, 341 (1842). DRAPER RUGGLES ET AL., DEFENDANTS IN ERROR. The case was submitted to the Court on printed arguments by 337*337 Mr. Choate, for the plaintiffs in error; and by Mr. Dexter, for the defendants. This case is brought here by a writ of error to the Circuit Court of the United States, for the district of Massachusetts. The action was instituted for the purpose of recovering damages for an infringement of a patent, which the plaintiffs had obtained for an improvement in the construction of the plough. Heretofore, the standard and landside of the plough has been placed perpendicular to, and at right angles with the plane of the share; on this standard the beam has been placed in such manner as to form an acute angle with the landside, of such extent as to place that part of the beam to which the moving power is applied at the distance of three or more inches from an extended line of the landside, to the right; while the after-part of the beam extends one or more inches to the left of the perpendicular of the landside, near the handle; the object has been to cause the plough `to run to land,’ or hold its width of furrow. The effect produced has been an uneasy, struggling motion, as it meets resistance at the point, wing, or heel. We make our plough with the standard and landside forming an acute angle with the plane of the share, the standard inclining to the right or furrow side, in such manner as to enable us to place the centre of the beam on a line parallel with the landside, the forepart thereof at such distance from the extended line aforesaid, as to cause the plough to hold its width of furrow, and the after-part falling within the perpendicular of the landside of the plough, the centre of it being nearly perpendicular to the centre of resistance, on the mould-board, which we conceive to be at about one-fourth part of the lateral distance from the landside to the wing of the share, and at about one-third part of the perpendicular 338*338 height from the plane of the share to the upper edge of the mould-board. This location of the centre of resistance, we base on the fact, that many ploughs which have been used in sharp, sandy soils, have been worn quite through at that point. The result of this formation of the plough, is a steady, well-balanced motion, requiring less power of draft, and less effort in directing the plough in its course. The inclination of the standard and landside causes the plough to cut under, and take up the furrow in the form of an oblique-angled parallelogram, or like a board, feather-edged, which being turned over, falls in level with the last furrow more readily than right-angled or square-edged work. The coulter or knife, having a similar inclination, cuts the roots of the grass, &c., and leaves all vegetable matter on the surface, at a greater distance from the under edge of the furrow, which being turned over, more readily falls in, and is far better covered than with square-edged work. The top of the standard, through which the bolt passes to secure the beam, is transversely parallel to the plane of the share, and extends back from the bolt to such distance as to form a brace to the beam, when the after-part is passed down by lifting at the forepart; the share being fast under a rock, or other obstruction, the after-part of this extension is squared in such manner, that being jogged into the beam, it relieves the bolt in heavy draft. The bolts which we use to fasten the pieces of cast iron, of which our ploughs are made, together, and the wood-work, are round, with inverted convex heads, like the wood screw, with a projection on the under side of the head, of semicircular form, which fits into a groove in the counter-sink part of the bolt hole, as it is cast to receive it, which not only prevents its turning, but also diminishes the liability of breakage at the corners of square holes; all which will more fully appear by reference to the drawing annexed to, and forming part of this specification. 339*339 1. The inclining the standard and landside so as to form an acute angle with the plane of the share. 2. The placing the beam on a line parallel to the landside, within the body of the plough and its centre, nearly in the perpendicular of the centre of resistance. The plaintiffs offered to prove the utility of the alleged improvement, which proof was dispensed with by the defendants. Certain ploughs alleged by the plaintiffs to be made in conformity with their letters patent, and certain ploughs made by the defendants, which were the alleged infringement of the plaintiff’s patent, were produced in Court; and no substantial difference between them was shown by the defendants to exist, unless the fact, that the top of the standard in the defendant’s plough was not jogged into the beam, and did not extend so far back upon the beam, was to be so considered. And the plaintiffs offered evidence to show, that the top of the standard formed, as stated in the specification, would serve for both purposes of brace and draft, although not jogged into the beam. The counsel of plaintiffs respectfully move the Court to instruct the jury, that if the defendants have used, in combination with the other two parts, a standard of the description set forth in the specification, and it is proved to serve both for brace and draft, such use was an infringement of the plaintiffs claim in that particular, although the defendants may not have inserted into a jog in the beam. Also, that if any two of the three parts described, as composing the construction claimed in the specification, had been used in 340*340 combination by the defendants, it was an infringement of the patent, although the third had not been used with them. 1. The inclining the standard and landside so as to form an acute angle with the plane of the share. 3. The forming the top of the standard for brace and draft. That unless it is proved, that the whole combination is substantially used in the defendants’ ploughs, it is not a violation of the plaintiffs’ patent, although one or more of the parts specified, as aforesaid, may be used in combination by the defendants. And that the plaintiffs, by their specification and summing up, have treated the jogging of the standard behind, as well as the extension, to be essential parts of their combination for the purpose of brace and draft; and that the use of either alone by the defendants would not be an infringement of the combination patented. And thereupon the jury rendered their verdict for the defendants. The first question presented by the exception is, whether the extension of the standard, and the jogging of it into the beam, are claimed as material parts of the plaintiff’s improvement. We think they are. In the paragraph in which it is described, he states that it “extends back from the bolt to such a distance as to form a brace to the beam;” and also, “that being jogged into the beam it relieves the bolt in a heavy draft.” And in their summing up, they declare that they claim as new, and of their invention, the construction of such ploughs as aforesaid, and the several parts thereof, not separately but in combination; and proceeding then to specify the parts so claimed, they mention, “the forming of the top of the standard for brace and draft.” They indeed say that they do not mean to confine their claim to any particular form of construction, 341*341 except “to such form of the top as shall serve for brace and draft.” That is to say, the top is to be so formed and so connected with the beam as to answer both purposes. And as those purposes, according to the preceding part of the specification, are to be accomplished by its extension back from the bolt, and by jogging it into the beam, these two things are essential to it whatever variation may be made in its shape or size. They are, therefore, material parts of the improvement they claim. The remaining question may be disposed of in a few words. The patent is for a combination, and the improvement consists in arranging different portions of the plough, and combining them together in the manner stated in the specification for the purpose of producing a certain effect. None of the parts referred to are new, and none are claimed as new; nor is any portion of the combination less than the whole claimed as new, or stated to produce any given result. The end in view is proposed to be accomplished by the union of all, arranged and combined together in the manner described. And this combination, composed of all the parts mentioned in the specification, and arranged with reference to each other, and to other parts of the plough in the manner therein described, is stated to be the improvement, and is the thing patented. The use of any two of these parts only, or of two combined with a third, which is substantially different, in form or in the manner of its arrangement and connection with the others; is therefore not the thing patented. It is not the same combination if it substantially differs from it in any of its parts. The jogging of the standard into the beam, and its extension backward from the bolt, are both treated by the plaintiffs as essential parts of their combination for the purpose of brace and draft. Consequently the use of either alone, by the defendants, would not be the same improvement, nor infringe the patent of the plaintiffs. JAMES STIMPSON, DEFENDANT IN ERROR. 451*451 The case was argued by Mr. Coxe, and Mr. Southard, for the plaintiffs in error; and by Mr. J.R. Ingersoll, for the defendant. 457*457 Mr. Justice STORY delivered the opinion of the Court. This is a writ of error to the judgment of the Circuit Court for the Eastern District of Pennsylvania, rendered in an action brought by Stimpson, the defendant in error, against the plaintiffs in error, for a violation of a patent right granted to him for a new and useful improvement in the mode of turning short curves on railroads. A patent was originally granted to Stimpson, for the same invention, on the 23d day of August, 1831; and the renewed patent, upon which the present suit is brought, was granted on the 26th of 458*458 September, 1835, upon the former letters patent “being cancelled on account of a defective specification;” and the renewed patent was for the term of fourteen years from the date of the original patent. With the exception of the recital of the fact that the former letters patent were cancelled “on account of a defective specification,” and the statement of the prior date from which the renewed patent was to begin to run, the renewed patent is in the precise form in which original patents are granted. The first exception taken is to the admission of the renewed patent as evidence in the cause to the jury. The patent act of 1832, ch. 162, sec. 3, under which this patent was obtained, provides, that whenever any patent shall be inoperative or invalid, by reason that any of the terms or conditions prescribed by the prior acts of Congress, have not, by inadvertence, accident, or mistake, and without any fraudulent or deceptive intention, been complied with on the part of the inventor, it shall be lawful for the Secretary of State, upon the surrender to him of such patent, to cause a new patent to be granted to the inventor, for the same invention, for the residue of the period then unexpired for which the original patent was granted, upon his compliance with the terms and conditions prescribed by the third section of the act of the 21st of February, 1793, ch. 55. Now, the objection is, that the present patent does not contain any recitals that the prerequisites thus stated in the act have been complied with, viz. that the error in the former patent has arisen by inadvertency, accident, or mistake, and without any fraudulent or deceptive intention; and that without such recitals, as it is the case of a special authority, the patent is a mere nullity, and inoperative. We are of opinion that the objection cannot, in point of law, be maintained. The patent was issued under the great seal of the United States, and is signed by the President, and countersigned by the Secretary of State. It is a presumption of law, that all public officers, and especially such high functionaries, perform their proper official duties until the contrary is proved. And where, as in the present case, an act is to be done, or patent granted upon evidence and proofs to be laid before a public officer, upon which he is to decide, the fact that he has done the act or granted the patent, is prima facie evidence that the proofs have been regularly made, and were satisfactory. No other tribunal is at liberty to re-examine or controvert the sufficiency of such proofs, if laid before him, when the law has made such officer the proper judge of their sufficiency and competency. It is not, then, necessary for the patent to contain any recitals that the prerequisites to the grant of it have been duly complied with, for the law makes the presumption; and if, indeed, it were otherwise, the recitals would not help the case without the 459*459 auxiliary proof that these prerequisites had been, de facto, complied with. This has been the uniform construction, as far as we know in all our Courts of justice upon matters of this sort. Patents for lands, equally with patents for inventions, have been deemed prima facie evidence that they were regularly granted, whenever they have been produced under the great seal of the government; without any recitals or proofs that the prerequisites of the acts under which they have been issued have been duly observed. In cases of patents, the Courts of the United States have gone one step further, and as the patentee is required to make oath that he is the true inventor, before he can obtain a patent, the patent has been deemed prima facie evidence that he has made the invention. This objection, then, is overruled; and there was no error in the Circuit Court in the admission of the patent. The next exception is to the refusal of the Court to allow a witness, Josiah White, to give a description of an invention which he had seen on the Mauch Chunk railroad, in 1827, which had a groove on one side, and run on the other on a flange for crossing, for the purpose of showing that the supposed invention of the plaintiff was known and in use by others, before the date of his patent. By the patent act of 1836, (which was applicable to the present point,) it is provided in the fifteenth section, that whenever the defendant relies in his defence on the fact of a previous invention, knowledge, or use of the thing patented, he shall state in his notice of special matter to be used in his defence, the names and places of residence of those, whom he intends to prove to have possessed a prior knowledge of the thing, and where the same had been used. The object of this most salutary provision is to prevent patentees being surprised at the trial of the cause, by evidence of a nature which they could not be presumed to know, or be prepared to meet, and thereby to subject them either to most expensive delays, or to a loss of their cause. It is incumbent on those who seek to show that the examination of a witness has been improperly rejected, to establish their right to have the evidence admitted; for the Court will be presumed to have acted correctly, until the contrary is established. RICHARD PETERS AND JOHN GRIGG. 595*595 The case was argued by Mr Paine and Mr Webster, for the appellants; and by Mr Ingersoll, by a printed argument, and Mr Sergeant, for the defendants. 654*654 Mr Justice M’LEAN delivered the opinion of the Court. Some of the questions which arise in this case are as novel, in this country, as they are interesting. But one case involving similar principles, except a decision by a state court, has occurred; and that was decided by the circuit court of the United States for the district of Pennsylvania, from whose decree no appeal was taken. The right of the complainants must be first examined. If this right shall be sustained as set forth in the bill, and the defendants shall be proved to have violated it, the court will be bound to give the appropriate redress. The complainants assert their right on two grounds. First, under the common law. Secondly, under the acts of congress. And they insist, in the first place, that an author was entitled, at common law, to a perpetual property in the copy of his works, and in the profits of their publication; and to recover damages for its injury, by an action on the case, and to the protection of a court of equity. In support of this proposition, the counsel for the complainants have indulged in a wide range of argument, and have shown great industry and ability. The limited time allowed for the preparation of this opinion, will not admit of an equally extended consideration of the subject by the court. Perhaps no topic in England has excited more discussion, among literary and talented men, than that of the literary property of authors. So engrossing was the subject, for a long time, as to leave few neutrals, among those who were distinguished 655*655 for their learning and ability. At length the question, whether the copy of a book or literary composition belongs to the author at common law, was brought before the court of king’s bench, in the great case of Miller v. Taylor, reported in 4 Burr. 2303. This was a case of great expectation; and the four judges, in giving their opinions, seriatim, exhausted the argument on both sides. Two of the judges, and Lord Mansfield held, that, by the common law, an author had a literary property in his works; and they sustained their opinion with very great ability. Mr Justice Yeates, in an opinion of great length, and with an ability, if equalled, certainly not surpassed, maintained the opposite ground. Previous to this case, injunctions had issued out of chancery to prevent the publication of certain works, at the instance of those who claimed a property in the copyright, but no decision had been given. And a case had been commenced, at law, between Tonson and Collins, on the same ground, and was argued with great ability, more than once, and the court of king’s bench were about to take the opinion of all the judges, when they discovered that the suit had been brought by collusion, to try the question, and it was dismissed. This question was brought before the house of lords, in the case of Donaldson v. Beckett and others, reported in 4 Burr. 2408. Lord Mansfield, being a peer, through feelings of delicacy, declined giving any opinion. The eleven judges gave their opinions on the following points. 1st. Whether at common law an author of any book or literary composition, had the sole right of first printing, and publishing the same for sale; and might bring an action against any person who printed, published and sold the same, without his consent. On this question there were eight judges in the affirmative, and three in the negative. 2d. If the author had such right originally, did the law take it away, upon his printing and publishing such book or literary composition; and might any person, afterward, reprint and sell, for his own benefit, such book or literary composition, against the will of the author. This question was answered in the affirmative, by four judges, and in the negative by seven. 3d. If such action would have lain, at common law, is it taken away by the statute of 8 Anne; and is an author, by 656*656 the said statute, precluded from every remedy, except on the foundation of the said statute, and on the terms of the conditions prescribed thereby. Six of the judges, to five, decided that the remedy must be under the statute. 4th. Whether the author of any literary composition, and his assigns, had the sole right of printing and publishing the same in perpetuity, by the common law. Which question was decided in favor of the author, by seven judges to four. 5th. Whether this right is any way impeached, restrained or taken away, by the statute 8 Anne? Six, to five judges, decided that the right is taken away by the statute. And the lord chancellor, seconding Lord Camden’s motion to reverse, the decree was reversed. It would appear from the points decided, that a majority of the judges were in favor of the common law right of authors, but that the same had been taken away by the statute. The title and preamble of the statute, 8 Anne, ch. 19, is as follows: “An act for the encouragement of learning by vesting the copies of printed books in the authors or purchasers of such copies, during the times therein mentioned. “Whereas printers, booksellers and other persons, have of late frequently taken the liberty of printing, reprinting and publishing, or causing to be printed, reprinted and published, books and other writings without the consent of the authors or proprietors of such books and writings, to their very great detriment, and too often to the ruin of them and their families,” &c.
299*299 The case was submitted to the court, on printed arguments, by Mr Paine, for the plaintiff in error; and Mr Emmet, for the defendant. 310*310 Mr Justice M’LEAN delivered the opinion of the Court. This writ of error brings before this court, for its revision, a judgment of the circuit court of the United States for the southern district of New York. An action was brought in the circuit court by Shaw against the defendant Cooper, for the violation of a certain patent right, claimed by the plaintiff. The defendant pleaded the general issue, and gave notice that on the trial he would prove “that the pretended new and useful improvement in guns and fire arms, mentioned and referred to in the several counts in the declaration; also that the said pretended new and useful improvement, or the essential parts or portions thereof, or some or one of them, had been known and used in this country, viz. in the city of New York and in the city of Philadelphia, and in sundry other places in the United States, and in England, in France, and in other foreign countries, before the plaintiff’s application for a patent as set forth in his declaration,” &c.
On the trial, the following bill of exceptions was taken: “to maintain the issue joined, the plaintiff gave in evidence certain letters patent of the United States, as set forth in the declaration, issued on the 7th day of May 1829; and also that the improvement for which the letters were granted, was invented or discovered by the plaintiff in 1813 or 1814; and that the defendant had sold instruments which were infringements of the said letters patent. “And the defendant then proved, by the testimony of one witness, that he had used the said improvement in England, and had purchased a gun of the kind there, and had seen others use the said improvement, and had seen guns of the kind in the duke of York’s armoury in 1819. And also proved by the testimony of five other witnesses, that, in 1820 and 1821, they worked in England at the business of making and repairing guns, and that the said improvement was generally used in England in those years; but that they had never seen guns 311*311 of the kind prior to those years: and also proved that in the year 1821, it was used and known in France; and also that the said improvement was generally known and used in the United States after the 19th day of June 1822. “And the plaintiff, further to maintain the issue on his part, then gave in evidence, that he not being a worker in iron in 1813 or 1814, employed his brother in England, under strict injunctions of secrecy, to execute or fabricate the said improvement for the purpose of making experiments. And that the plaintiff afterwards, in 1817, left England and came to reside in the United States; and that after his departure from England, in 1817 or 1818, his said brother divulged the secret for a certain reward to an eminent gun maker in London. That on the arrival of the plaintiff in this country, in 1817, he disclosed his said improvement to a gun maker, whom he consulted as to obtaining a patent for the same, and whom he wished to engage to join and assist him. That the plaintiff made this disclosure under injunctions of secrecy, claiming the improvement as his own, declaring that he should patent it. That the plaintiff treated his invention as a secret after his arrival in this country, often declaring that he should patent it; and that this step was only delayed, that he might make it more perfect before it was introduced into public use: and that he did make alterations which some witnesses considered improvements in his invention, and others did not. That in this country the invention was never known nor used prior to the said 19th day of June 1822; that on that day letters patent were issued to the plaintiff, being then an alien, and that he immediately brought his invention into public use. That afterwards, and after suits had been brought for a violation of the said letters patent, the plaintiff was advised to surrender them on account of the specification being defective; and that he did accordingly, on the 7th day of May in the year 1829, surrender the same into the department of the secretary of state, and received the letters patent first above named. And the court, on these facts, charged the jury that the patent of the 7th of May 1829, having been issued, as appears by its recital, on the surrender and cancelment of the patent of the 19th day of June in the year 1822; and being intended to correct a mistake or remedy a defect in the latter; it must be considered as a continuation of the said patent, and the rights of the plaintiff were to be determined by the state of things which existed in the year 1822, when the patent was first obtained. That the plaintiff’s case, therefore, came under the act passed the 17th day of April 1800, extending the right of obtaining patents to aliens; by the first section of which the applicant is required to make oath, that his invention has not, to the best of his knowledge or belief, been known or used in this or any foreign country. That the plaintiff most probably did not know, in the year 1822, that the invention for which he was taking out a patent, had, before that time, been in use in a foreign country; but that his knowledge or ignorance on that subject was rendered immaterial by the concluding part of the section, which expressly declares, that every patent obtained pursuant to that act, for any invention which it should afterward appear had been known or used previous to such application for a patent, should be utterly void. That there was nothing in the act confining such use to the United States; and that, if the invention was previously known in England or France, it was sufficient to avoid the patent under that act. That the evidence would lead to the conclusion that the plaintiff was the inventor in this case, but the court were of opinion that he had slept too long on his rights, and not followed them up as the law requires, to entitle him to any benefit from his patent. That the use of the invention, by a person who had pirated it, or by others who knew of the piracy, would not affect the inventor’s rights, but that the law was made for the benefit of the public as well as of the inventor; and if, as appears from the evidence in this case, the public had fairly become possessed of the invention before the plaintiff applied for his patent, it was sufficient, in the opinion of the court, to invalidate the 314*314 patent; even though the invention may have originally got into public use through the fraud or misconduct of his brother, to whom he entrusted the knowledge of it. Under this charge the jury found a verdict for the defendant, on which a judgment was entered. There is a general assignment of errors, which brings to the consideration of the court the principles of law which arise out of the facts of the case, as stated in the bill of exceptions. It may be proper, in the first place, to inquire whether the letters patent which were obtained in 1829, on a surrender of the first patent, have relation to the emanation of the patent in 1822, or shall be considered as having been issued on an original application. On the part of the plaintiff it is contended, that “the second patent is original and independent, and not a continuation of the first patent.” That in adopting the policy of giving, for a term of years, exclusive rights to inventors in this country, we adopted at the same time the rules of the common law as applied to patents in England: and that by the common law, a patent when defective may be surrendered to the granting power, which vacates the right under it, and the king may grant the right de novo either to the same or to any other person. THE CITY COUNCIL OF CHARLESTON, DEFENDANTS. 451*451 The case was argued by Mr Hayne, for the plaintiffs in error; and by Mr Cruger and Mr Legare, for the defendants. 463*463 Mr Chief Justice MARSHALL delivered the opinion of the Court. This case was argued on its merits at a preceding term; but a doubt having arisen with the Court respecting its jurisdiction in cases of prohibition, that doubt was suggested to the bar, and a re-argument was requested. It has been reargued at this term. In this case the city ordinance of Charleston is the exercise of an “authority under the state of South Carolina,” 464*464 “the validity of which has been drawn in question on the ground of its being repugnant to the constitution,” and “the decision is in favour of its validity.” The question therefore which was decided by the constitutional court, is the very question on which the revising power of this tribunal is to be exercised, and the only inquiry is, whether it has been decided in a case described in the section which authorises the writ of error that has been awarded. Is a writ of prohibition a suit? The term is certainly a very comprehensive one, and is understood to apply to any proceeding in a court of justice, by which an individual pursues that remedy in a court of justice, which the law affords him. The modes of proceeding may be various, but if a right is litigated between parties in a court of justice, the proceeding by which the decision of the court is sought, is a suit. The question between the parties, is precisely the same as it would have been in a writ of replevin, or in an action of trespass. The constitutionality of the ordinance is contested; the party aggrieved by it applies to a court; and at his suggestion, a writ of prohibition, the appropriate remedy, is issued. The opposite party appeals; and, in the highest court, the judgment is reversed and judgment given for the defendant. This judgment was, we think, rendered in a suit. We think also that it was a final judgment in the sense in which that term is used in the 25th section of the judicial act. If it were applicable to those judgments and decrees only in which the right was finally decided, and could never again be litigated between the parties, the provisions of the section would be confined within much narrower limits than the words import, or than congress could have intended. Judgments in actions of ejectment, and decrees in chancery dismissing a bill without prejudice, however deeply they might affect rights protected by the constitution, laws, or treaties of the United States, would not be subject to the revision of this Court. A prohibition might issue, restraining a collector from collecting duties, and this Court would not revise and correct the judgment. The word “final” must be understood in the section under consideration, as applying 465*465 to all judgments and decrees which determine the particular cause. 4*4 Mr Webster, for the plaintiff in error. Mr Sergeant, for the defendant. 14*14 Mr. Justice STORY delivered the opinion of the Court. This is a writ of error to the circuit court of Pennsylvania. The original action was brought by the plaintiffs in error for an asserted violation of a patent, granted to them on the 6th of July 1818, for a new and useful improvement in the art of making leather tubes or hose, for conveying air, water, and other fluids. The cause was tried upon the general issue, and a verdict was found for the defendant, upon which judgment passed in his favour; and the correctness of that judgment is now in controversy before this court. The record contains, embodied in the bill of exceptions, the whole of the testimony and evidence offered at the trial by each party, in support of the issue. It is very voluminous, and as no exception was taken to its competency, or sufficiency, either generally or for any particular purpose; it is not properly before this Court for consideration, and forms an expensive and unnecessary burthen upon the record. This Court has had occasion in many cases to express its regret, on account of irregular proceedings of this nature. There was not the slightest necessity of putting any portion of the evidence in this case upon the record, since the opinion of the court delivered to the jury, presented a general principle of law, and the application of the evidence to it was left to the jury. In the argument at the bar, much reliance has been placed upon this evidence, by the counsel for both parties. It has been said on behalf of the defendants in error; that it called for other and explanatory directions from the court, and that the omission of the court to give them in the charge, furnishes a good ground for a reversal, as it would have furnished in the court below for a new trial. But it is no ground of reversal that the court below omitted to give directions to the jury upon any points of law which might arise in the cause, where it was not requested by either party at the trial. It is sufficient for us that the court has given no erroneous directions. If either party deems any point presented by the evidence to be omitted in the charge, it is competent for such party to require an opinion from the court upon that point. If he does not, it is a waiver of it. 16*16 The court cannot be presumed to do more, in ordinary cases, than to express its opinion upon the questions which the parties themselves have raised at the trial. On the other hand, the counsel for the defendant in error has endeavoured to extract from the same evidence, strong confirmations of the charge of the court. But, for the reason already suggested, the evidence must be laid out of the case, and all the reasoning founded on it falls. The single question then is, whether the charge of the court was correct in point of law. It has not been, and indeed cannot be denied, that an inventor may abandon his invention, and surrender or dedicate it to the public. This inchoate right, thus once gone, cannot afterwards be resumed at his pleasure; for, where gifts are once made to the public in this way, they become absolute. Thus, if a man dedicates a way, or other easement to the public, it is supposed to carry with it a permanent right of user. The question which generally arises at trials, is a question of fact, rather than of law; whether the acts or acquiescence of the party furnish in the given case, satisfactory proof of an abandonment or dedication of the invention to the public. But when all the facts are given, there does not seem any reason why the court may not state the legal conclusion deducible from them. In this view of the matter, the only question would be, whether, upon general principles, the facts stated by the court would justify the conclusion. 359*359 This cause was argued by Mr. Webster and Mr. Sergeant, for the plaintiff, and by the Attorney General, for the defendant. This was a suit commenced by the plaintiff, Keplinger, in the Fourth Circuit for the District of Maryland, against the defendant, for the violation of the plaintiff’s patent right, secured to him according to law, in a certain new and useful improvement, to wit, a machine for making watch chains, &c. The third count in the declaration, upon which alone this cause has been argued, is in the usual form, charging the defendant with having unlawfully used the said improvement, without the consent of the plaintiff first had and obtained in writing. The defendant pleaded the general issue, and gave notice to the plaintiff that he should deny that the exclusive right of using the improvement mentioned in the declaration, was vested in the plaintiff, or that he was the original and first inventor of the said improvement, and that he should give evidence to establish those facts. 360*360 At the trial, the plaintiff read in evidence the letters patent duly granted, bearing date the 4th of May, 1820, and proved, that he was the true and original inventor of the machine specified in the patent, and that the defendant, together with John Hatch and John C. Kirkner, did use the said machine in the making of watch-chains from steel, from the 4th of May till some time in the month of December, 1820. The defendant also gave evidence to prove 362*362 that all the connexion he ever had with the said Hatch & Kirkner, relative to watch-chains made by them with the said machine or otherwise, was merely as a purchaser of such chains from them, under and in pursuance of the said contract. The plaintiff then proved, that, at the time of making the said contract, the defendant was fully apprized of the existence of the machine described and specified in the patent, and of its prior and original invention by the plaintiff, and of the intention of the plaintiff to obtain the said patent; and that the said contract was made with a view to the employment by the said Hatch & Kirkner, in the manufacture of watch-chains, of a machine precisely similar to that invented by the plaintiff, after the plaintiff should have obtained his patent; and that a machine precisely similar to that invented by the plaintiff was employed by the said Hatch & Kirkner in the manufacture of watch-chains by them under the said contract, and with the knowledge and consent of the defendant during the whole period aforesaid, he and they having received notice, on the 5th of May, 1820, of the plaintiff’s patent; and that the watch-chains so manufactured by Hatch & Kirkner, during the whole of the said period, were delivered by them to the defendant, and by him received, under and in conformity with the said contract. Upon this evidence, the Court, at the request of the defendant’s counsel, instructed the jury, that the plaintiff was not entitled to a verdict on the first and second counts in his declaration. 363*363 because the acts which they charge, if true, constitute no offence against the plaintiff’s patent. And that, if the jury should be of opinion, on the evidence, that the plaintiff is the sole and original inventor of the whole machine; and that the defendant had no other connexion with Hatch & Kirkner with regard to these chains, than that which arose from his said contract with them, under which he procured the chains to be made by Hatch & Kirkner, and sold them when so made; and that the said contract is a real contract; then these acts constituted no breach of the plaintiff’s patent-right on the part of De Young, and that the verdict must be for the defendant; and that this legal aspect would not be changed, although the defendant may, on any occasion, have supplied, at the cost of Hatch & Kirkner, the wire from which the chains so manufactured were made. To this instruction the plaintiff’s counsel took a bill of exceptions, and a verdict and judgment having been rendered for the defendant, the cause is brought into this Court by a writ of error. The only question which is presented by the bill of exceptions to the consideration of this Court is, whether the Court below erred in the instruction given to the jury; and this must depend upon the correct construction of the 3d section of the act of Congress, of the 17th of April, 1800, c. 179. which enacts, “that where any patent shall be granted, pursuant to 364*364 the act of the 21st February, 1793, c. 156. and any person without the consent of the patentee, his executors, &c. first obtained in writing, shall make, devise, use, or sell, the thing whereof the exclusive right is secured to the said patentee by such patent, such person so offending shall forfeit and pay to the said patentee, a sum equal to three times the actual damage sustained by such patentee,” &c.
You are currently browsing the archives for the Supreme Court Patent Case of the Week category.